Artisans shave these delicate gold flakes extremely thin, with a thickness of approximately 0.000125 mm, so there is absolutely no scratching and only pure pleasure when they melt in your mouth, and compliment the dark Belgian chocolate. Exquisitely beautiful and richly decadent, this is a timeless, divine gift for any occasion. Select 12 or 24 Fresh Strawberries. Covered in Belgian Chocolate and Gold Flakes. Arrives in an Insulated Gift Box for Perfect Presentation. 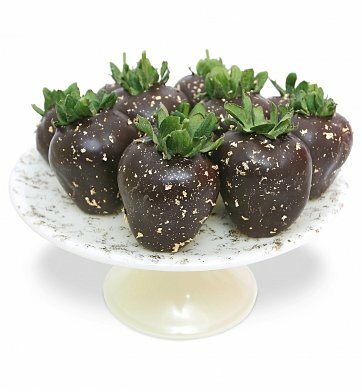 Berries are wrapped for freshness and nestled in compartment trays within an elegant gift box. A complimentary card with your personal gift message is included. 23 Karat Edible Gold Berries is a hand delivered gift. These gifts are delivered by one of our local design centers located throughout the United States and Canada. Same day delivery is available for most gifts when ordered before the cutoff time. The cutoff time for 23 Karat Edible Gold Berries is in the recipient's time zone. Firm, ripe strawberries, hand-selected for freshness and size. Covered in rich dark Belgian chocolate and 23K gold flakes. Arrives in an elegant, insulated gift box for impressive presentation.